DIAMOND jubilarian Fr Ivan Hernon (pictured) had a very special guest to a celebration luncheon and home Mass at Scarborough recently – an old friend who had served at the priest’s first Mass at Coorparoo 60 years ago. The retired Cairns diocesan priest and his mate Alf Roughan, of Mitchelton, enjoyed reminiscing on that first Mass at the celebrations on June 30. They remembered their other two good friends, now deceased – Bill Ryan and George Vincent – who also served at that Mass all those years ago. The luncheon was one of many events Fr Hernon will celebrate in his jubilee year. The Presbyteral Jubilee Mass at St Stephen’s Cathedral on June 25 launched celebrations. Fr Hernon and 19 other Queensland priests, including Bishop John Gerry, were honoured at the Jubilee Mass. Born and raised in Coorparoo, Fr Hernon is a past pupil of St James’, Coorparoo, and a Gregory Terrace Old Boy. In 1947, he entered Banyo Seminary as a student for the Brisbane archdiocese to complete his secondary education before commencing his studies for the priesthood. Archbishop James Duhig invited Cairns’ first bishop Thomas Cahill to address the Brisbane seminarians in February 1949 to seek volunteers for the Cairns diocese, pending the gradual withdrawal of the Irish Augustinians. Fr Hernon was one of a number who volunteered and, after his ordination in Brisbane’s St Stephen’s Cathedral in June 1955, took up his northern appointment. 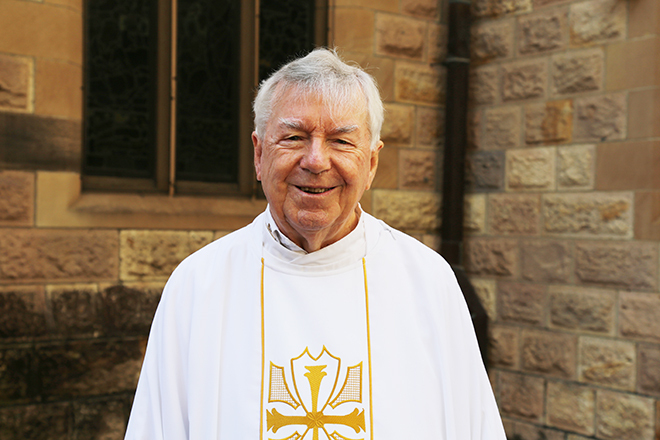 He remained there until June 2000 when, at age 74, he retired from parish responsibilities and returned to Brisbane to be near his family at Scarborough. Since then, he has assisted especially in the Holy Cross Parish, Redcliffe, as well as Caloundra, West Chermside, Petrie, and in recent years Caboolture, Bribie Island and Beachmere. Family friend Carmel Hunter said, “Fr Ivan is a man who loves to celebrate life and special occasions, and the diamond jubilee of his ordination to the priesthood is a very good reason to do just that”. “He also organised a home Mass and luncheon on June 29 attended by family members and former parishioners of the Cairns diocese now living in Brisbane,” she said. “Three family members – his cousin Patricia Neilson, nephew Patrick Darch, and brother-in-law Fred Darch – were present. Ms Hunter said Fr Hernon’s jubilee year celebrations would continue in Brisbane before he visited his brother Leo in Sydney. “Fr Ivan will then leave for Cairns, first to Malanda, his last parish before retirement, then to Tully, where he was parish priest for 12 years,” she said. “Final celebrations will be at a Mass in St Monica’s Cathedral, Cairns.